Forex traders decided to avoid or dump the euro during and shortly after ECB President Mario Draghi’s most recent press conference, which is understandable since Draghi flat out downgraded both the inflation and growth outlooks for the Euro Zone. So, how is the euro zone doing lately? Let’s take a look, shall we? The preliminary reading for the euro zone’s Q2 2015 GDP showed a 0.3% quarter-on-quarter expansion, which is slightly slower than the previous quarter’s 0.4% growth, and therefore a bit disappointing to some forex traders. Still, an expansion is always better than stagnation or a contraction, and the euro zone has been growing for 9 consecutive quarters now, so it ain’t all that bad. Moreover, Q2 2015 GDP grew by 1.2% (+1.0% previous) on an annualized basis, which is the third consecutive month of increasing annualized growth, so the euro zone’s recovery is far from over. Among the major euro zone economies, Germany (+0.4 current, +0.3% previous) and Spain (+1.0% current, +0.9% previous) both grew at an accelerated rate while Italy grew at a slower rate (+0.2% current, +0.3% previous). As for France, well, it stagnated (+0.0% current, +0.7% previous). The jobless rate for July dropped to 10.9% after three months of remaining steady at 11.1%, which the lowest level since February 2012 and is therefore great news. Among the major euro zone economies, Germany was still the top dog with a rather low jobless rate of 4.7%. Lagging behind were France and Italy with 10.4% and 12.0% respectively. In last place was Spain, which had a rather horrible 22.2%. As a side-note, Spain has the second highest jobless rate in the entire European Union – only Greece is doing worse with 25.0%. The average European consumer is still feeling a bit blue since the preliminary reading for the European Commission’s consumer confidence indicator is still in the red at -6.9 for the month of August, but it’s a slight improvement over July’s -7.2. July’s dampened consumer sentiment didn’t seem to have a significant effect on consumer spending, though, since the retail sales volume in July actually advanced by 0.4% month-on-month while June’s 0.6% slide was revised higher to only show a stumble of 0.2%. According to Eurostat’s report, the monthly increase in sales volume was due to a 0.8% increase in demand for automotive fuel, followed by a 0.2% increase for the “Food, drinks and tobacco” component. Year-on-year, retail sales volume grew by around 2.7%, which is much better than the previous reading of +1.7%. Markit’s manufacturing PMI for August ticked very slightly lower to 52.3 from 52.4, but on a more upbeat note, manufacturing employment rose at the fastest pace in four years, so there’s a good chance that the jobs data and consumer spending for August will see an improvement too. Among the major economies, Germany really picked up the pace (53.3 current, 51.8 previous) while Italy (53.8 current, 55.3 previous) and Spain (53.2 current, 53.6 previous) slowed down a bit. 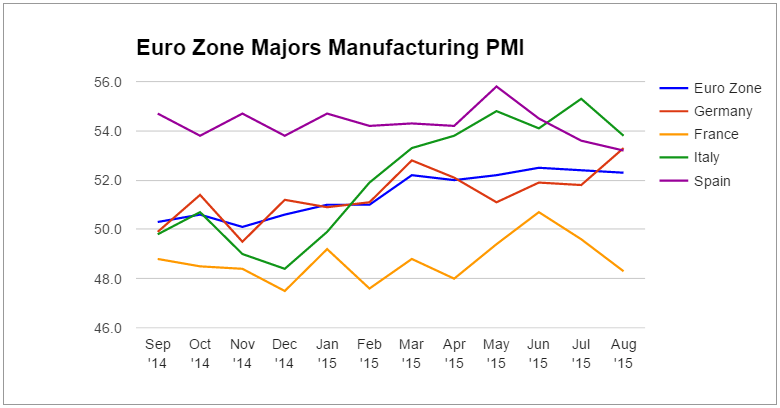 France, meanwhile, was a major drag since its manufacturing sector contracted further (48.3 current, 49.6 previous). The only happy news came from Markit’s services PMI since it increased from 54.0 back in July to 54.4 in August, which marks the 25th month of consecutive expansion. Eurostat’s preliminary estimate for August’s annualized CPI showed that headline inflation remained steady at 0.2%, and the same is true for the core reading at 1.0%. According to the report, energy prices are the primary souce for deflationary pressure, sinking lower by 7.1% (5.6% previous). This was offset by services remaining steady at 1.2% while “food, alcohol & tobacco” prices increased to 1.2% from 0.9% in July. Well, the most recent data actually paints a pretty picture for the euro zone since the recovery still seems to be under way. And while most business indicators took a slight dip, PMI readings are hinting that the employment and consumer spending data for August may see some improvement, which may convince some forex traders to load up on the euro in anticipation of the upcoming data. The ECB’s slight downgrade to their inflation and growth projections may continue to put some selling pressure on the euro, but there’s also a good chance that the event has already been priced-in by most forex traders. Still, if forex traders become too optimistic on the euro zone’s recovery and buy up the euro, then it could result in a vicious cycle of cheaper imports and weaker exports, fulfilling the ECB’s forecasts and threatening the euro zone’s fragile recovery.